Do you ever wonder what to do when the urge to sneeze hits? Or are you not sure what to say or do when someone else lets out a loud achoo? Are you unsure of the proper etiquette related to sneezing? You're not alone. Here are some things to consider whether you're the sneezer or someone who is exposed to a sneeze. Many people in America respond to a sneeze immediately by saying, "God bless you," a tradition that has its origins in various ancient beliefs and myths, ranging from ancient Greek culture to 14th-Century American superstitions. Some people believe that when someone sneezes they are actually expelling a sin or an evil spirit. Still others have been taught that during a sneeze the person's heart actually stops beating for a second. There are many more traditions and myths about sneezes, but the truth about them may help you formulate an appropriate response. In actuality, a sneeze is the body's reaction to allergens and irritants. The purpose of sneezing is to expel mucus containing foreign particles or irritants and thus to cleanse the nasal cavity. Sneezing is therefore potentially harmful to those within close range of the sneeze because they'll be sprayed with germs that can make them sick since the average sneeze contains upwards of around 100,000 infectious airborne droplets. When someone sneezes it is perfectly acceptable for you to turn aside in order to protect yourself from the spray. You may also want to ask if they are okay or if you may help them in any way. For example, if you have a hanky or tissue, you may choose to offer it to the sneezer. After the sneezing attack, take preventative measures by washing your hands and any other part of your body that might have been within range of the spray. When you feel a sneeze coming on, reach for a tissue as quickly as possible, unless you don't have one. In that case, turn away from other people and sneeze into your sleeve or the crook of your arm. If you sneeze more than two or three times, leave the room or the area where there are people. This isn't always possible, such as times when you are flying or on an elevator. Do everything you can to turn away from people and cover your nose and mouth. If someone offers you a disposable tissue during a sneeze, don't hand it back to them. They don't need or want your germs. Instead, toss it into the nearest trash receptacle as soon as you are finished with it. If you need to blow your nose, leave the area to prevent grossing others out by the disgusting sound. Wash your hands as soon as possible after you finish sneezing to prevent spreading germs to others. Say, "Excuse me" after you finish sneezing. If someone says, "God bless you," or "Gesundheit," thank the person. Avoid physical contact with anyone who has the flu or a cold. Wash your hands after touching knobs or anything else in public places. 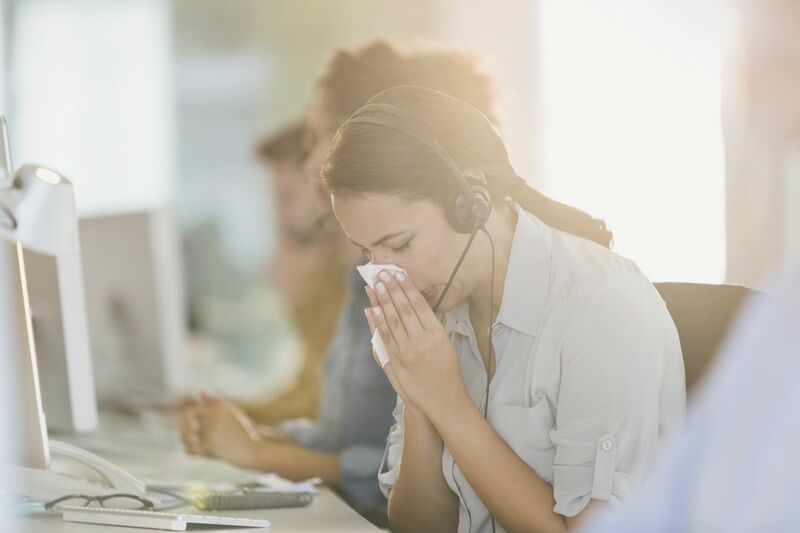 Eliminate allergens such as dust, pet dander, or anything else that you suspect might be the culprit causing you to sneeze. Eat nutritious foods in order to stay healthy. Load up on fruits and vegetables. Stay hydrated. Most health professionals recommend at least eight 8-ounce glasses of water per day. Squeeze the bridge of your nose. Press the area beneath your nose firmly but not until it hurts. Tickle the roof of your mouth with the tip of your tongue.